Your chances of striking gold during the special West Virginia Gold Rush trout stockings April 2-6 have increased. Due to growing interest and excitement, the Division of Natural Resources will stock golden rainbow trout at 20 new locations around the state, bringing the total number of stocked lakes and streams to 50, according to Jim Hedrick, Hatchery Program Manager. “Thanks to the diligence and hard work of staff at the Bowden, Spring Run, and Reeds Creek trout hatcheries, we have produced more golden trout than we expected when we announced this special event last fall,” Hedrick said in a press release. Find out more about Fishing in West Virginia. Hedrick said he new stocking locations are all lakes and include: Anawalt Lake, Brandywine Lake, Brushy Fork Lake, Burnsville Tailwaters, Curtisville Lake, Edward Run Pond, Fort Ashby Reservoir, Kimsey Run Lake, Mill Creek Reservoir, New Creek Dam No. 14, Poorhouse Pond, Rock Cliff Lake, Rockhouse Lake, Seneca Lake, South Mill Creek Lake, Summit Lake, Sutton Tailwaters, Teter Creek Lake, Thomas Park Lake, and Tuckahoe Lake. The purpose of the West Virginia Gold Rush is to get families, children and new anglers excited about trout fishing by giving them a good opportunity to catch this popular fish. 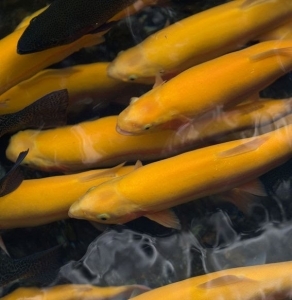 Normally, golden rainbow trout are stocked on a one-to-10 ratio with regular rainbow trout. During West Virginia Gold Rush week, DNR will stock only golden rainbow trout in the 50 designated lakes and streams, several of which are located in and near state parks and forests. Introduced to the public in 1963 as part of West Virginia’s centennial celebration, the golden rainbow trout is prized by anglers young and old for its unmistakable, bright-yellow color. For more than 50 years, golden rainbows have provided a special experience for anglers who have been lucky enough to catch them. More information about the West Virginia Gold Rush can be found here. Next articleGovernor signs bill to allow Sunday hunting on public lands in W.Va.
A consummate outdoorsman, Will Reedy has been hunting and fishing West Virginia since he was first able to wield rod and gun. He has been an outdoors writer for West Virginia Explorer since 2001.